For every homeowner, keeping your home in top-notch shape can be a struggle. When you are spending too much time on repairs and not enough time enjoying your home, the Sears Handyman Services team can help. Sears Handyman technicians have experience in everything from setting up your new energy-efficient toilet to ripping out your old decking. Rely on Sears Handyman Services when you need help that requires more than a screwdriver or wrench. Give us a call at (844) 224-2639. Household traffic, pets, and minor dings and dents can all contribute to the wear and tear on drywall. Usually, this requires taping, plastering, and painting over the unsightly blemish. When your drywall has become an eyesore, the Sears technician is equipped and ready to help. The technician will tackle your drywall issues and beautify your walls by patching, taping, or replacing and hanging new drywall. Decking can create an oasis of relaxation and pleasure. With summer barbecues, parties, and dancing under the moonlight, decks are gathering hubs for entertainment. However, decks require regular maintenance and care to keep your family safe and your yard inviting. 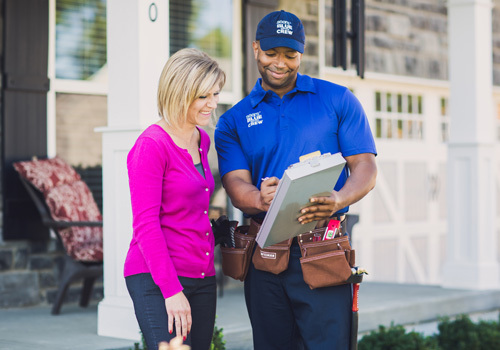 With Sears Handyman Services, you can rely on a technician to properly repair or replace areas of deterioration, apply protective staining against future water damage, build a new deck to your specific design and perform regular maintenance on an existing deck. Chain-link, bamboo, or wood fencing adds a certain solitude to your property. Having a distinct border also adds an element of privacy to your yard. In addition, keeping the family pet and children in a contained area brings peace of mind. When deciding to install a fence, you can rely on Sears Handyman Services. Our technicians are trained and equipped to handle all of your fencing needs. Giving your home a quick restoration is as easy as applying a coat of paint. Painting your home will give it a fresh, modern look. Mounting a scaffold or ladder, however, can prove difficult for some homeowners. Think about the messy cleanup, too. The Sears Handyman Services will remove all the old wallpaper, paint your home, and clean up after the job is done. So, as a homeowner, all you have to do is sit back and enjoy your freshly painted home.